Yay!! Christmas is getting closer and closer, I love it! Dana and I are here to help you with new recipe ideas for the holiday season. Now on Christmas Day we have the usual turkey, ham and all the trimmings but for Christmas Eve we decided to change it up a bit and have lasagna. It feeds a lot of people and really who doesn’t love lasagna? So it is a real crowd pleaser. Since you can assemble it even the night before it makes the hectic Christmas Eve go a lot more smoothly. Brown and drain the sausage and hamburger together. Add sausage and hamburger to large bowl and pour in the two jars of sauce. In separate bowl mix the ricotta, 2 eggs and 1 cup of cheese. Spread a thin layer of sauce in the bottom of a 9x13 dish. Place noodles on top of sauce. Spread 1/3 of the cheese mixture on the noodles. Sprinkle with a little more shredded mozzarella. Do another layer of noodles. Arrange peppers into Christmas Tree shape. Cover with foil and bake 30-40 minutes at 350 till bubbly. Remove foil last few minutes of baking to let cheese get brown. Want another alternative recipe for a Christmas Dinner main course? Check out Dana’s Slow Cooker Roasted Lemon Pepper Chicken! Yummy! Want more Christmas Recipes? Here is more from our Christmas Series! Don’t forget to check out our Thanksgiving Series for more recipes!! That is quite a beautiful way to serve lasagna for the holidays! How cute is that Christmas tree!? You had me at Italian sausage–sounds delicious! This lasagna made me smile! Would never have thought of it. Speaking of alternative Christmas trees you may enjoy a recent post I put together over at http://www.ritewhileucan.com/faux-fir hope you stop by to check them out. Visiting via Lovely Ladies Linkup. I love the Christmas tree you’ve made on your lasagna. So cute! Thanks for sharing at Simple Supper Tuesday. Stopping by from SImple Suppers. What a cute, festive lasagna. Great idea! 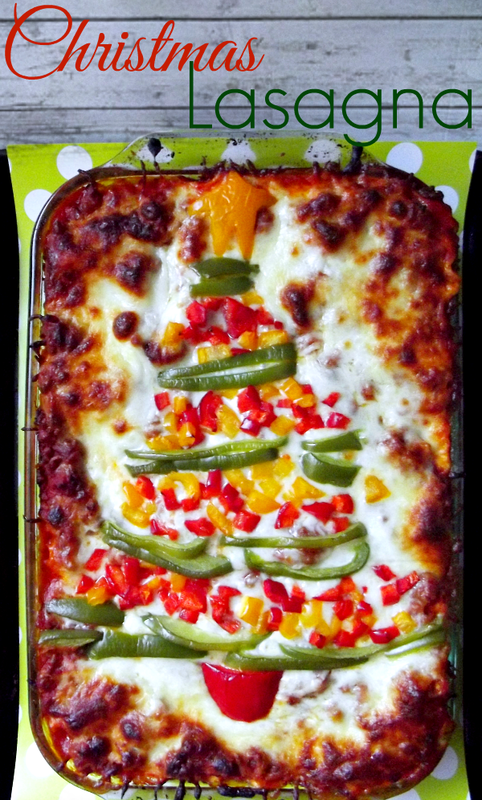 This lasagna looks so colorful and festive that I would want to serve it at every party! just popping over from the DIY Showcase Link Party. I have pinned, liked and tweeted, and g+-ed. I would love it if you would drop by my site at http://www.kneadedcreations.com for a short visit! I will look forward to seeing you there! Deb @ Kneaded Creations. Thanks for linking this up to our Marvelous Monday party…. pinning to my MM board! Hope to see you next week! This is such a super cute idea. Thanks for sharing at the Pinworthy Projects Party! Hi there! Wanted to let you know that I really enjoyed your recipe for Christmas Lasagna and have chosen it as one of my favorites from last week’s Saturday Spotlight blog hop. It’s been featured on this week’s blog hop which starts at 6am EST on Saturday, and will be PINed to my Pinterest page. Thanks so much for linking up! Looking forward to seeing what you have to share next time. What a super cute idea! Perfect for a Christmas dinner! Wow, I will have to make this for Christmas, and probably before too, yum! Thanks for the Christmas recipe. I am going to have company for Christmas day and I will prepare this delicious recipe..